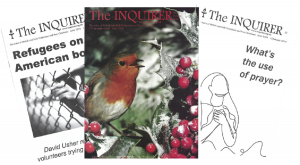 It costs over £30,000 every year to publish the Inquirer. The Inquirer relies on grants from churches, district associations, the GA and individuals to continue its existence. Through prudent financial management we have managed to sustain the paper for over 175 years to ensure that it is an integral part of the Unitarian movement.